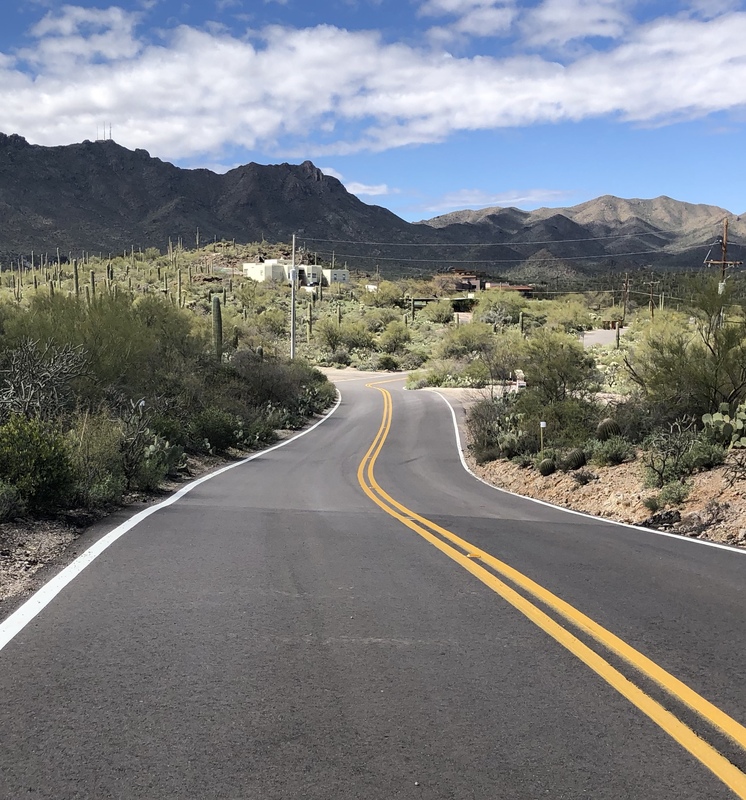 The Five Fingers of West Tucson are five roads that head up into the Tucson Mountains, from Sunset Road in the North to the Gates Pass Road in the South. 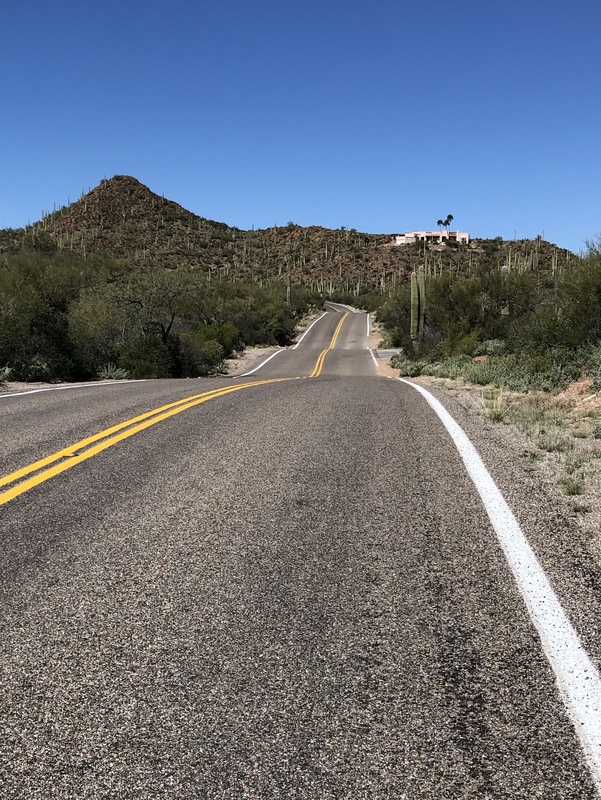 The ride is about 46 miles with 3,275 feet of climbing. You can obviously start either end, but I chose to start with Sunset Road. This means you avoid the long climb up Gates Pass up either Speedway, or (better) Anklam. However, you make up for this with the climb up Camino de Oeste. 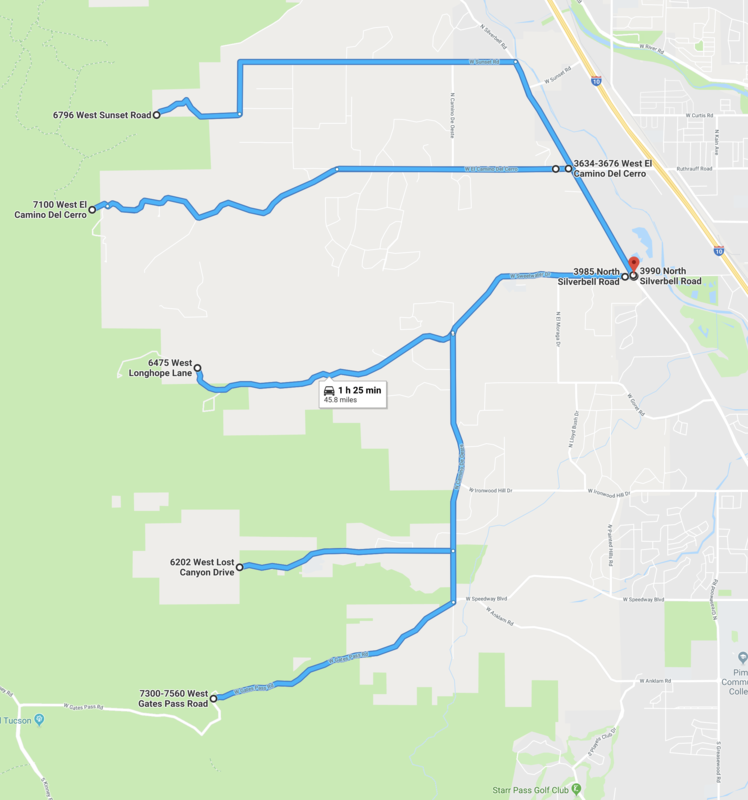 I did this ride in March 10, 2019, and parked at the intersection of Silverbell and Sweetwater then rode north on Silverbell for about 2.3 miles to Sunset. The ride itself is not that long (46 miles), but there are lots of steep rollers which take it out of your legs. And you can add more miles by starting somewhere more distant. The riding in the northern three fingers is wonderful, with the upper sections being gorgeous, twisting and turning and rolling, always with beautiful views of the hills and the occasional amazing house. This ride is a shorter and easier version of a much longer ride, The Seven Snakes of Silverbell. Back down at Silverbell, turn right and ride along Silverbell for about a mile to the base of El Camino del Cerro. El Camino del Cerro. Round trip of 9.7 miles with 715 feet of climbing. The road is a bit busier than Sunset and the rollers are less big, but the last 2.5 miles are simply incredible. Again, the road twists and turns and dips, with lovely views and some very steep short pitches, one of which reaches 14%. Back down at Silverbell, turn right and ride about a mile to the base of Sweetwater Drive. Sweetwater Drive. 4.6 miles one way, with 475 feet of climbing. I describe this as one way as on the way down you only descend to Camino de Oeste, where you’ll turn right. 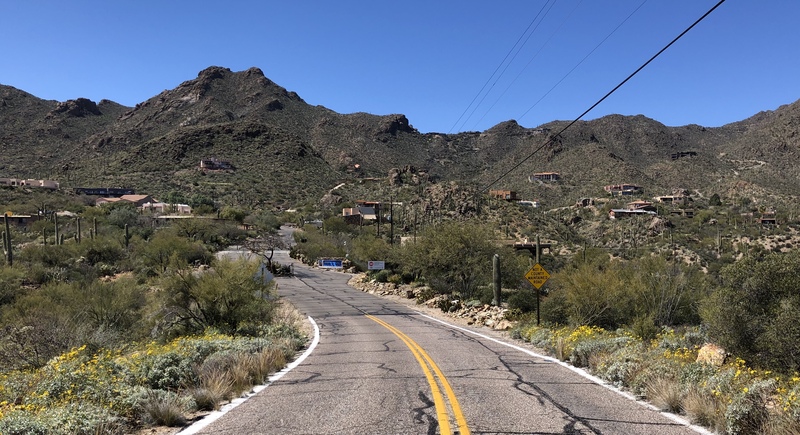 The start of Sweetwater Drive is a bit busier than the previous two climbs but in about two miles the road splits, with Camino de Oeste turning left, and Sweetwater Drive continuing up to the right. Head back down to Camino de Oeste and turn right. You’ll be riding along this for about 2 miles to Trails End Road on your right. Trails End Road. Round trip of 4.1 miles with 430 feet of climbing. 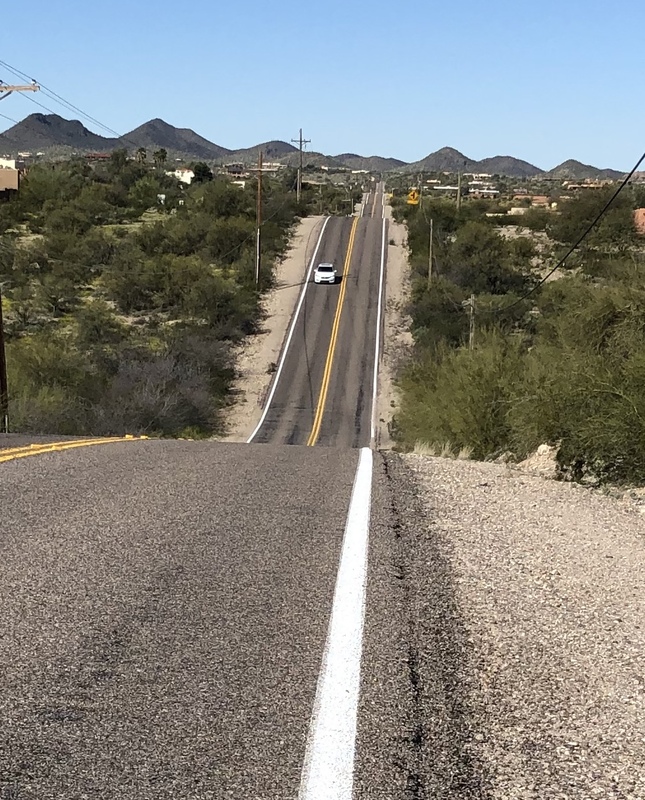 This climbs fairly consistently until the road curves left then right, with a little sting in the tail is it rears briefly up to about 13%. After about 2 miles from the base, you’ll reach the gate where you turn around. Above the gate are many houses in a spectacular bowl, with some incredibly steep-looking roads leading up to a few houses on the ridge line. Something to dream about. Back down at Camino de Oeste turn right and ride for about 0.5 miles to the Gates Pass Road. Gates Pass Road. Round trip of 5 miles with 560 feet of climbing. This is the busiest of the fingers, and the road needs repair in places. Be careful on this road. The angle varies quite a bit, and there’s a brutally steep section just below the pass and the big parking area on the right. 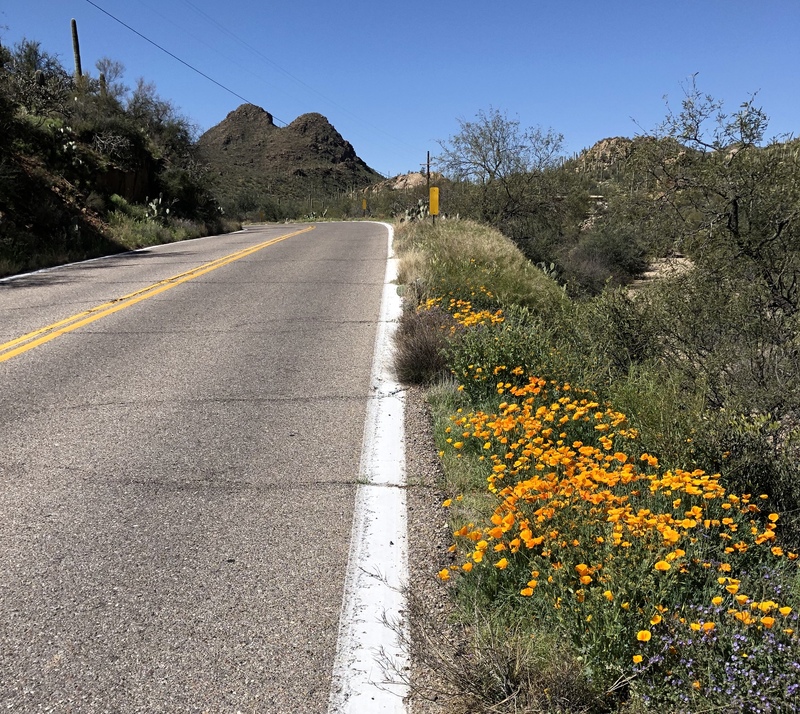 Descend back to Camino de Oeste, turn left, and follow this back down to Silverbell. The Seven Snakes of Silverbell, a longer and harder version of this ride.